As I am working with mongodb for different application development,the more I explore mongo the more I am amazed. 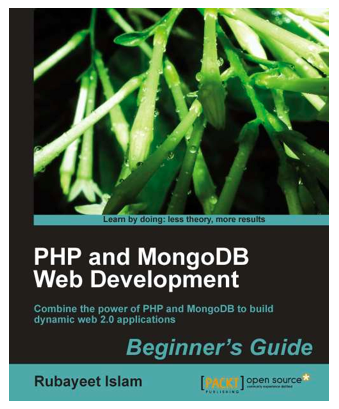 I got a review copy from Packt couple of weeks ago and started to read PHP and MongoDB Web Development Beginner’s Guide. Chapter 1:As Nosql is a new technology yet,people talk more than using it in their production.And in the first chapter author described what is NoSql,Types of NoSQl and why mongdb.Ttraditional and very effective way to start exploring a technology.The important part of this chapter is mongodb concepts section.There is a mongodb is quiet different than any other traditional db and here there is a difference in basic terminology too.Author described those point with example. Chapter2:As its a beginners guide author chose blog application development and here the mongo querying comes through returning article from mongo back-end.Interesting part was,author focused on mongodb details implementation and feature.Like Upsert,Update and save. chapter3:Building a session manager,here a session manager was built with the blog implementation. chapter4:Aggregation queries one of the most important chapter of the book.For db administrating,building complex business model application developers have to gain mastery in db he is using for his application.In this chapter MapReduce was explained and implemented also found different essential querying based on count(),distinct. The mapreduce is very essential concepts the examples are real life problems solving using mapreduce,I found it very useful. chapter5:A very simple version of web analytics was built and why we can choose mongodb for different analytics solution was described.Mapreduce implementation for analytics is the fun part and reader will learn to aggregation in different use cases for his analytics. Chapter 6: Focuses on Mongodb with mysql.when to use,how it fits.mongodb as a data archive system. Chapter7 : This chapter is about Gridfs,mongodbs file storage solution.A simple application is built to show its power and author also mentioned when should not mongodb. Chapter 9 and 10:Security and administration section.Useful section is implementation indexing in mongodb,indexing in embeded document fields.Optimization rules will be very help full section to boost the mongo performance and the end of the chapter replication is described.Chapter 10 is all about mongo administration using GUI application like rock mongo and PHPmongo. So overall this book is a good reference/training book who wants to learn mongodb using PHP for first time,beside that author explained many under the hood topics. Clear instruction and several pop up quizes made the chapters enjoyable to read and learn.What I expected bit more about scaling monogo,partitioning,sharding different topics.May be as the book is written for the Beginner these topics has been avoided.